Tagged with " bulk cooking"
I’ve noticed people seem to have a lot of peculiarities about their chocolate chip cookies. Some people like thick chewy ones, others want a crunchier bite. Some people add in ingredients like peanut butter or pumpkin to the batch and some like it straight off the bag. This recipe appeals to the first crowd. 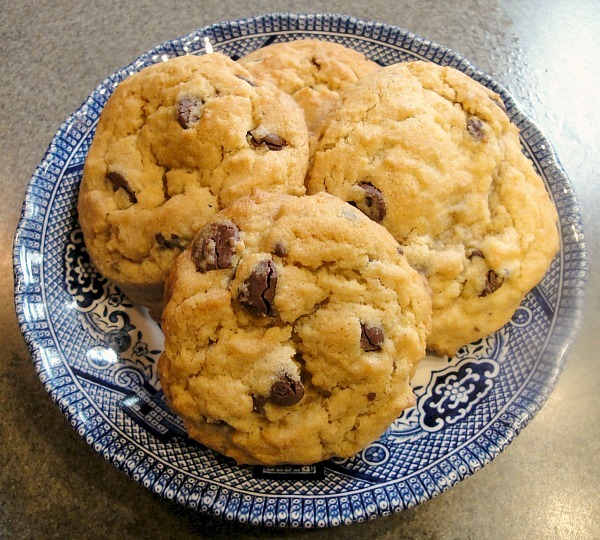 The Chewy is a chocolate chip recipe with a fluffy dough that rises thanks to some instant vanilla pudding in the batter. It’s a very cake-like cookie which should come as no surprise since so many cakes have pudding in them as well. 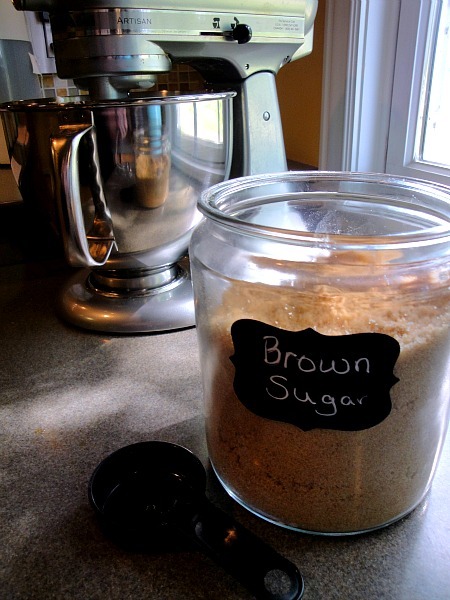 The mix of white and brown sugar also leads to a very soft cookie. This cookie is all about the texture. It’s also great for freezing. I made this at the same time I made my M&M cookies and I froze 4 dozen of these cookies and 3 dozen of those cookies. I may have sampled some in the meantime and I promise you I gobbled them up all too willingly. Cream together the butter, sugars, and pudding mix. Beat in the eggs and vanilla. Combine the flour and baking soda. While stirring, add the dry ingredients gradually to the wet ingredients. I’ll admit that sometimes in life, I can go a little overboard. I mentioned before that I had some eggs to use up before I left town for my vacation and the apple bread just didn’t cut it. I decided this would be the perfect time for me to get ready for Christmas. That’s right, back on September 12 I decided to bake 11 dozen cookies for Christmas. I made 6 dozen chocolate chip ones (recipe coming soon!) and 5 dozen of today’s recipe, M&M cookies. That’s a bit of an exaggeration. I did in fact bake 11 dozen cookies and packed them away in 3 separate containers. One container was eaten in the week before my trip. It held 2 dozen cookies. The other 9 dozen were split between 2 more containers and one is still safely tucked away for Christmas. The other has been eaten in the month since I returned. This is how I roll. I bake a bunch of cookies, eat most of them and save a couple dozen for Christmas. Over the next few months I’ll stock it with some peanut butter chocolate chip cookies, gingerbread and sugar cookies (undecorated), and some double chocolate chip ones. The ones I don’t eat by Christmas become a January snack, though to be honest I’m usually cookied-out by then. I store my cookies for up to 3 months in an airtight stackable container already cooked. I just pull them out about 90 minutes before I eat them and they’re perfect. Cream together the sugars and the shortening. Blend in the eggs, vanilla, and water. In a separate bowl mix together the dry ingredients and gradually add them to your wet ingredients. 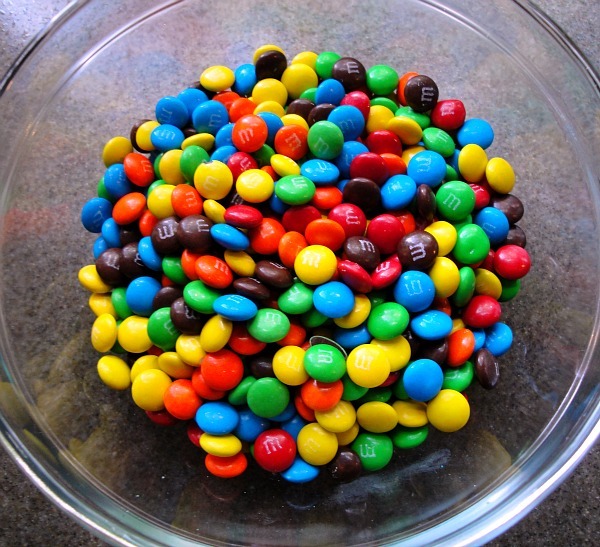 Gently stir in your mini M&Ms (regular will work as well) and bake at 375 degrees for 9 minutes. Remember my centerpiece from September with all those apples? The centerpiece sat on my table for most of the month but I headed out of town on the 19th so I hated to let the apples go to waste. On top of that, I had some eggs that would go bad while I was out of town so I figured doing some baking with the apples was a good way to use some up. I wanted a recipe that I could stick in the freezer and eat when I came back home too. Luckily, apple bread was the perfect solution. 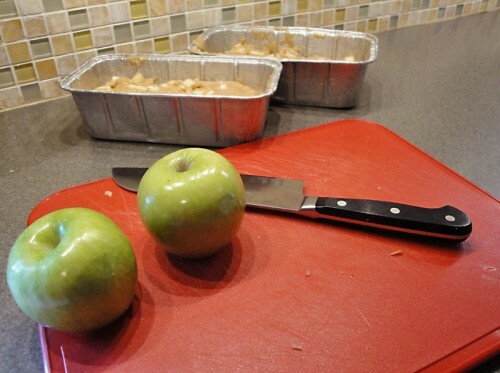 This recipe makes two disposable loaf pans of apple bread. To freeze it, bake the apple bread and let it cool completely. Let it cool another hour more, just to be safe. Place the entire loaf pan into a gallon sized freezer bag and remove all the air you can. Place the bags into the freezer flat and store for up to a month. If you want to store these longer, remove them from the loaf pans and wrap in plastic wrap before putting them in the freezer bag. Coming back from vacation I had virtually no food I could cook left in my house. 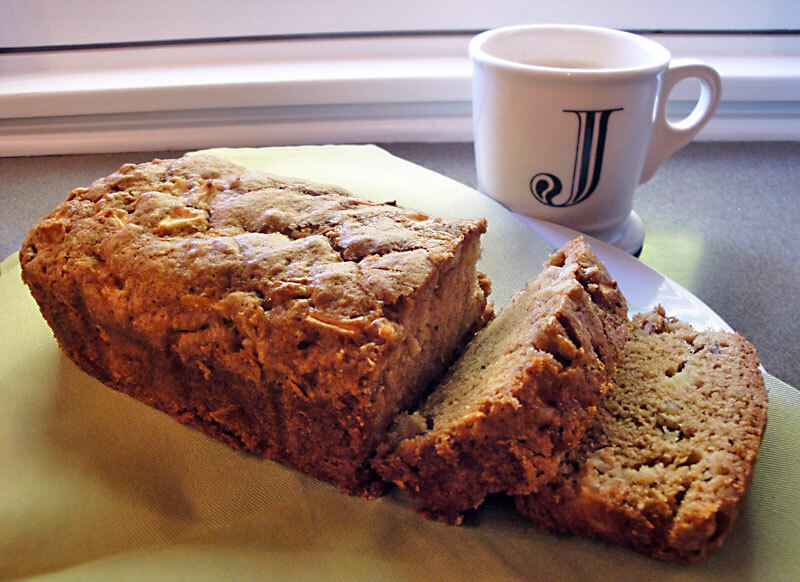 I had been up for about 20 hours before crashing at night and the next morning I didn’t want to be eating cereal without milk so the apple bread was a welcome treat. To thaw, just leave out on the counter overnight and it will be perfect in the morning. Mix together the flour, cinnamon, salt, baking soda, and baking powder. Set aside. Beat together the eggs, sugar, applesauce, oil, and almond extract. 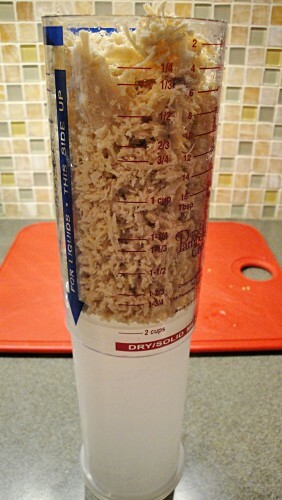 Slowly add in your dry ingredients, stirring until just mixed. Add in your diced apples and chopped walnuts. 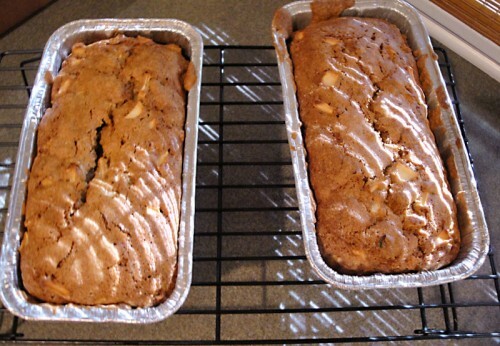 Pour batter into two greased loaf pans and bake at 1 hour for 350 degrees. In the summer there’s nothing better than throwing food on the grill and eating leftovers for days. Just because I like to eat some tasty food doesn’t mean I don’t love an effortless meal. When I saw the idea of these Pesto Chicken Skewers that La Kocinera shared, I knew I had to try them. 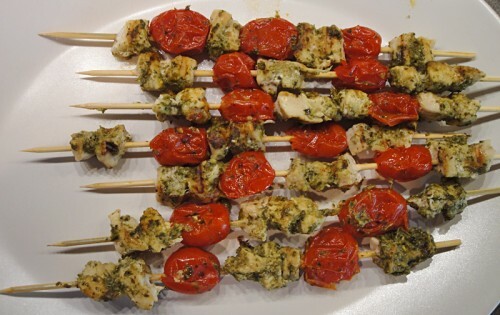 To prep for this recipe I soaked 7 skewers in water so they wouldn’t catch fire on the grill. 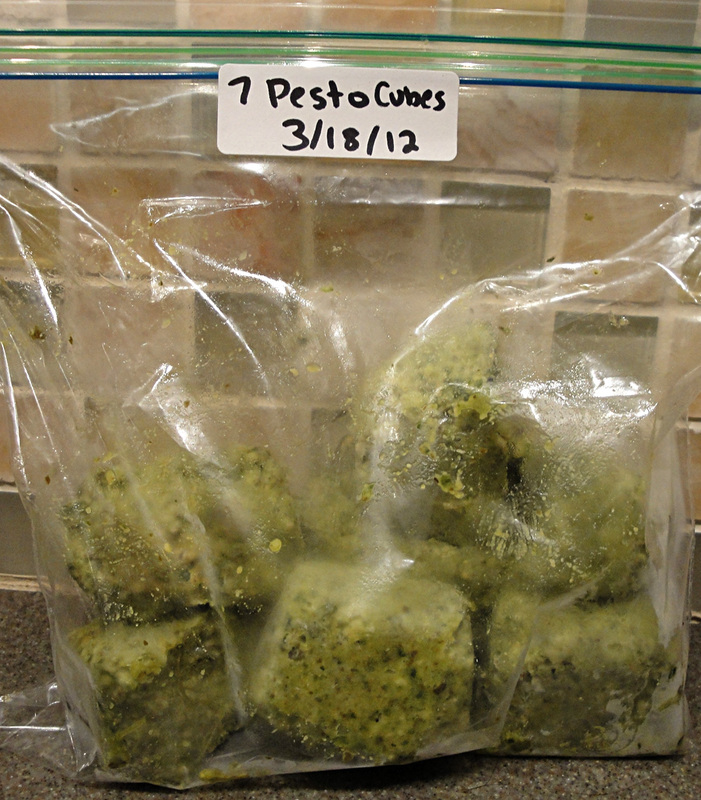 I also pulled out 3 of my frozen pesto cubes to thaw during the day. The only other ingredients you’ll need are 2 chicken breasts and a half pint of grape tomatoes. Just cut up the chicken into bite-sized pieces and alternate the pieces on the skewer with the tomatoes. Brush on some pesto and grill until the chicken is done. That’s it! It’s so easy you barely even need a recipe. 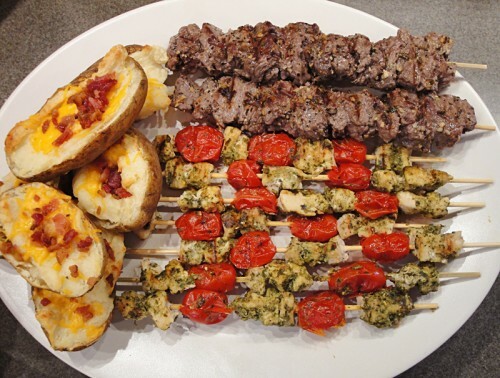 I served this recipe with some sirloin skewers and some of my frozen twice-baked potatoes along with a salad. Like I said, my goal is to eat off a meal for days and we had a weekend’s worth of food with this meal. 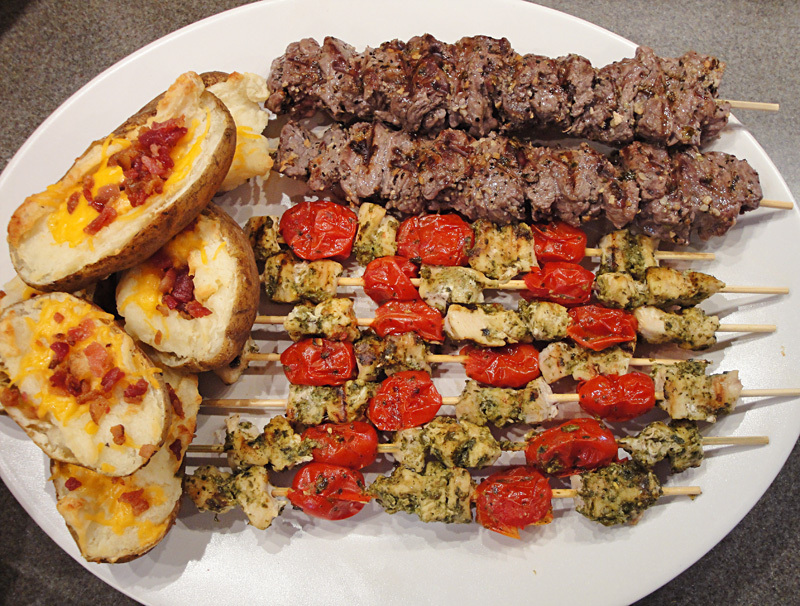 If using wooden skewers, soak in water for at least 20 minutes to prevent burning on the grill. 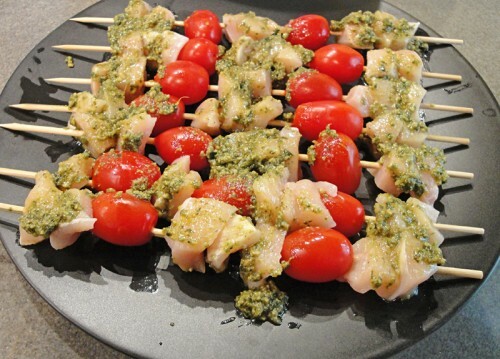 Alternate sliding chicken pieces and grape tomatoes onto your skewers. Brush with pesto. Heat your grill to a medium heat and cook about 5 minutes per side until the chicken juices run clear. The hot weather finally calmed down but I don’t trust it will stay away for long so I wanted to make this next recipe before summer really sets in. The hour of baking for this recipe means you do not want to prep this in the heat of summer. Many people think you can’t freeze potatoes. I’ve had a failure where all the potatoes turn black and I’ve had mashed potatoes that did alright but were never quite as good as the original without a little work. 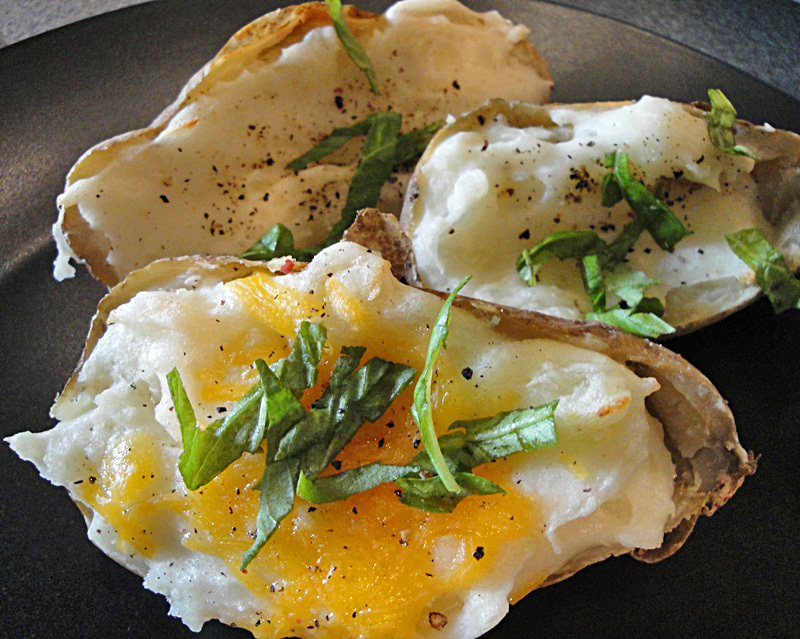 This recipe for freezer twice baked potatoes is a standout because they taste incredible after being in the freezer. The secret is that you freeze them after only the single bake and then you cook them in the oven right in their frozen state. I bought a 10 pound bag of potatoes from my local grocery store for only $2. I had used about 2 1/2 pounds of potatoes for other meals so I used 7 1/2 pounds (or 25 potatoes) for this recipe. I’ll share the full 10 pound recipe for you guys so you can just use a bag and not have to do a lot of guesswork. With so many potatoes, you’ll want to rotate the pans in the oven every half hour. I like to put my potatoes on baking sheets according to size so if the smallest potatoes finish after an hour I can just remove the small potato baking sheet and let the larger potatoes keep cooking until they have some give. I like to make my potatoes a little healthier so I try to use skim milk, laughing cow cheese (the queso and garlic ones are my favorites), and I leave the shredded cheese off my pieces. When I bake them I add cheese and bacon to my husband’s portions and I top mine with sour cream or Greek yogurt after I’ve baked mine. These also taste incredible with some pesto drizzled on top. The possibilities are endless. If you don’t care about those adjustments, regular milk or even half and half work for your liquid and regular cream cheese works perfectly with this recipe. I’ve done it all. When you store your items, make sure to let them freeze flat first. Then you can pop them in containers. I found these containers at the Dollar Store and I love the flat tops, they’re perfect for easy stacking. I usually fit between 4 and 8 halves in each container. When reheating I cook the entire package on a cookie sheet and eat any leftovers during the week with my lunch. My favorite way to eat these for lunch is to take some chili and pour it over a potato half. It’s perfection. Clean potatoes and dry. Place them on baking sheets. 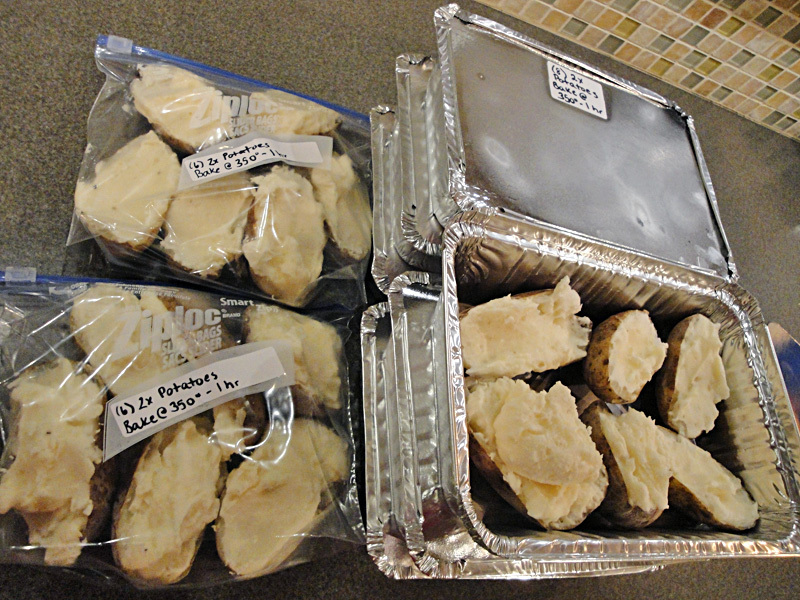 10 pounds of potatoes usually requires 3 baking sheets. Drizzle potatoes with olive oil and kosher salt. Bake potatoes for 1 to 1/2 hours depending on the size. Allow potatoes to cool around 15 minutes. While cooling, mix together butter, cream cheese (or laughing cow), salt, and pepper in a large mixing bowl. Cut potatoes in half lengthwise taking care not to damage the rest of the skins. Use a large spoon to scoop out the inside of the potatoes, leaving a thin layer of potato attached to the skin. Put the middles you scoop out into the mixer with your butter cheese blend. Once you've scooped out all the potatoes, place the shells back on the baking sheet with the skin side down. Blend potato and butter/cheese mix in your mixer. 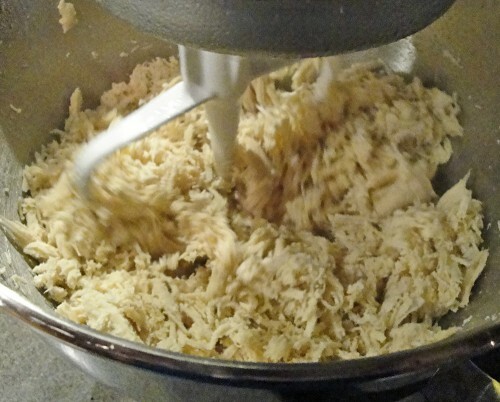 Add milk as needed until potatoes resemble stiff mashed potatoes. Spoon the potato mix back into the shells. If you are adding shredded cheese, sprinkle and press onto potatoes. Place pan back into the oven and bake 15-25 minutes. Cover baking sheet with plastic wrap and place baking sheet in freezer until potatoes are completely frozen. Remove potatoes from baking sheet and place in plastic bags or foil containers with baking instructions written on them. Preheat oven to 350°F and place potatoes on baking sheet. Loosely cover with foil. Bake about 45 minutes. Uncover foil and bake an additional 15 minutes. So the other day I shared my top 5 tips for freezer cooking and as promised I’m back to show you how I prepped 26 meals while I cooked dinner and cleaned the dishes. This big project focused on Step 2: Make Your Meals Speedy. Do you ever run into that dreaded feeling around 5 o’clock that you didn’t pull anything out to thaw and now dinner won’t be ready until the end of time when all you want to do is sit on the couch, drink some wine and watch some trash TV? I hope I’m not alone in those kind of days. The best way to avoid those days is to cook your meat ahead of time. I don’t suggest cooking all meats ahead of time by any means but ground beef and chicken cuts are the perfect thing to prepare and have ready in a pinch. Pay close attention to these supplies as you plan your freezer cooking. You’ll be cooking several meats so save money by shopping the sales (rule 5) and visiting Costco (rule 4). I also had luck at my local Aldi store since you can’t beat their celery prices most days. The night before your cooking day, thaw some chicken breasts. Some people will stick frozen chicken breasts straight in a crockpot and while some modern crockpots may keep your food in a safe zone, it’s safer to put thawed chicken in your crockpot so that’s what we’ll be doing for this project. About 4 hours before dinner, place your thawed chicken breasts in a crockpot. I have a small Rival crockpot so 9 chicken breasts fit about perfectly. This will vary based on the size of your crockpot and chicken pieces. You’ll want to fill the crockpot at least halfway with liquid. I like to pour in one can of chicken broth and fill the rest with water. Set your crockpot on high and cook about 4 hours. I was making a long but hands off meal in the kitchen so I prepped my meal and my bulk cooking at the same time and finished assembling while dinner was in the oven. First, I chopped up the entire stalk of celery. 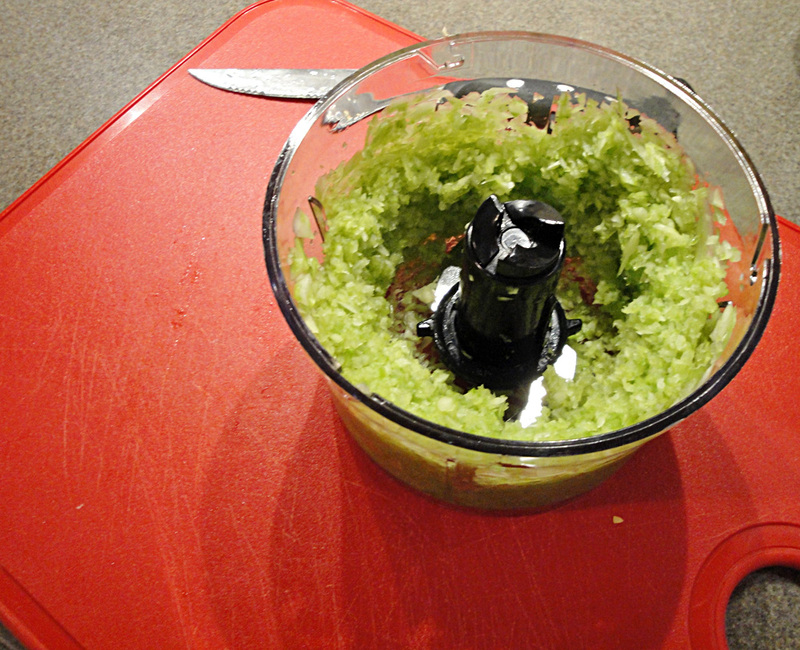 Rather than waste time with a knife I just threw it in my food processor attachment and chopped it up very finely. I had two separate packs of ground beef I had gotten on sale so I chose the smaller pack (3.4 pounds) and threw it and the diced celery into the preheated stockpot on the stove. I use my Pampered Chef Mix n Chop to separate the beef, then I throw the lid on so the meat cooks faster. After about 10 minutes with some occasional stirring, all my meat was cooked and finely chopped. I poured the meat into a strainer to drain the fat and let it cool. While it was cooling I cooked the other 6.6 pounds of meat I had in the same method, sans celery. You can season these meat batches any way you want while cooking them. While the beef was cooking and dinner was still in the oven, I had strained my chicken of all the liquids. I then threw the chicken breasts into my Kitchenaid mixer with the batter blade attached and in seconds I had perfectly shredded chicken. I could easily chop the chicken by hand but remember, this is a speed run. My dinner was nearing completion as I rushed to finish my last pre-dinner task. I used my handy Pampered Chef Measure-All Cup and set it for 2 cups. I had quart sized Ziplock bags* set aside and I filled each bag with 2 cups (1 lb) of whatever meat I had prepped. I threw an address label on some bags and wrote out what was in the bag (1 lb ground beef + veggies) and the date. I left all the bags open and on the counter to finish cooling (since steam=water=ice crystals=freezer burn) and I served up that night’s dinner while the cooling took place. After dinner I came in, sealed the bags after squeezing out as much air as possible, and stacked them flat in my freezer. After frozen you can store the bags upright in a mail crate in your deep freeze. One person takes care of the bags while the other loads the dishwasher and you can still fit in your wine and TV time. *Some people might freak out at Ziplock bags but here’s the deal: since you’re working with cooked meat you can reuse the bags and they take up the least amount of space in a freezer. Just cover up your old label with your new one each time you cook and you are good to go. 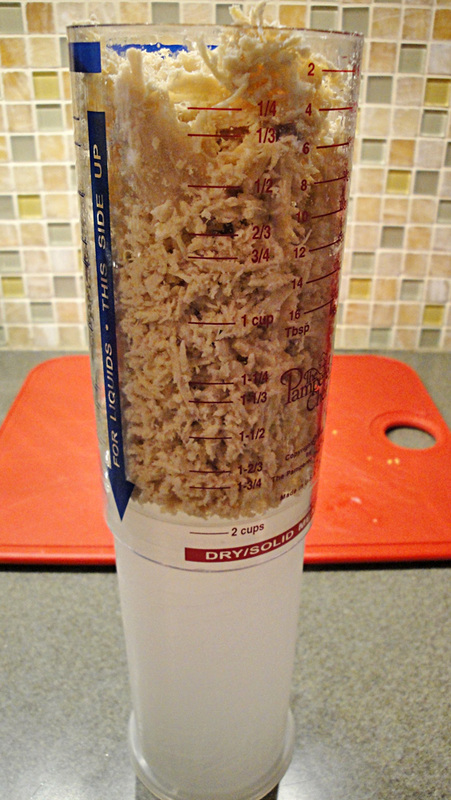 My chicken batch produced 7 1/2 cups of shredded chicken. This meant I had 3 bags plus a small container set aside for a lunch. I can thaw a bag of cooked chicken on the counter in 30 minutes, under hot water in 5 minutes, or it can go straight onto the stove. I use the shredded chicken for chicken salad, chicken pot pies, chicken burritos, or many other dishes. The chicken batch created 4 meals. My ground beef mixed with celery started off as 3.4 pounds of meat but the vegetable added stretched it to 12 cups. I would have had 7 bags of meat but I cheated and used one bag’s worth of meat in that night’s dinner. I thaw it the same way as the chicken and I use the meat+veggie combo in tomato based dishes like sloppy joes and spaghetti. The ground beef plus veggies batch created 7 meals. My plain ground beef batch started as 6.6 pounds of meat and created 25 cups of beef. I separated these into 10-2 cup batches that I’ll use for tacos and lasagna and 5-1 cup batches when I want a meal light on meat like ziti. 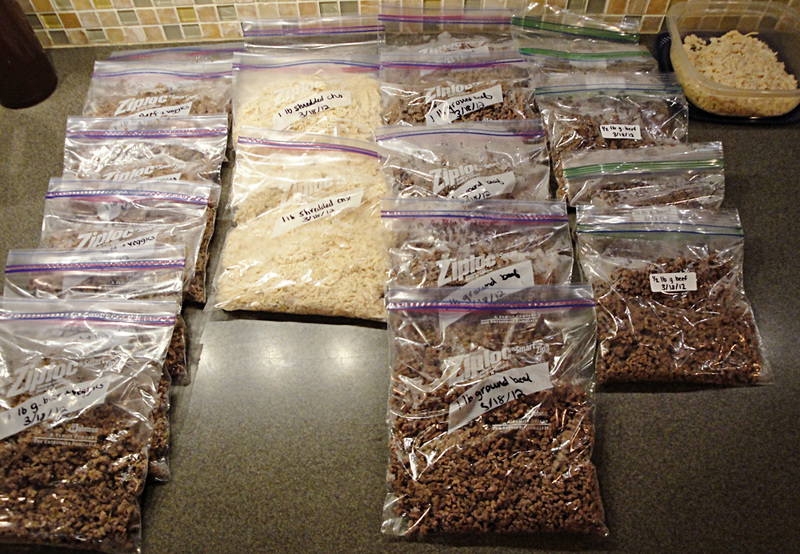 The ground beef batch created 15 meals. The average cost of my beef packs ended up at $1.40 per pack since my original 10 pounds of ground beef turned into 22 meals. I don’t remember the chicken price but I’ll take a look the next time I stop by Costco. While I don’t have 26 complete meals on hand, I prepped ingredients so now none of the above recipes will take longer than boiling noodles. That’s a huge way to shave time off your cooking and with most of your prep work done on those meals, you’ll have more time to watch Game of Thrones or How I Met Your Mother. I had some Costco pesto in my fridge nearing the expiration date so the night before my cook day I threw it into ice cube trays and froze it. While I was bagging all my other goods I put the ice cubes into some bags and stored them back in my freezer. Now I have perfect servings of pesto for baked potatoes or pasta, I didn’t waste my goods and I followed rule 5: freeze seasonally. If you can fit all 5 freezing rules into one cook day, you know you’ve done well. Shortly after I got married my parents passed down their aging deep freeze to me and my husband. I had a great time filling it and using it to store goods long term. Sadly, last year our freezer passed on and went to freezer heaven. It chose to go around 5 in the morning so we spent the early hours running items from a deep freezer we once loved to our tiny refrigerator’s freezer. Some goods didn’t make it while others were cooked up that day. The unexpected loss of our freezer put an end to our bulk cooking days. Early this year a family member had to downsize her home and during her downsizing sale I managed to snag a great deal on a chest freezer. I immediately shifted some of our items down to the new freezer but since then I haven’t done any bulk cooking or baking to stock it up. I wanted to really plan out what I wanted to stock it up with and what were my favorite ways to use it. Think about what you should be freezing this very moment. It’s spring right now so I want to be freezing food that will last our household the next 3 months. In the summer it is hot, I’m usually doing tons of projects, and I certainly don’t want to be running my oven on 90 degree days. In contrast, at winter time I’m always so cold that I want warm meals without having to get out from under my blankets to cook a huge meal. I’ve created a calendar to show what I like to freeze and when. 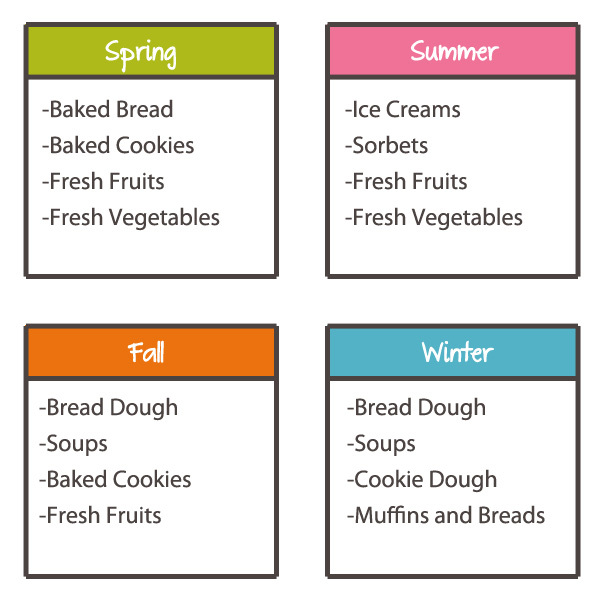 I’m always trying to flash freeze seasonal ingredients and quick meals but these are all specialty items I like to do each season to keep my freezer well-stocked. In the fall it’s the perfect time to roll out sugar cookies and gingerbread cookies and freeze them in fun cut out shapes. That way come winter you just need to decorate them. When you make your winter cookies like chocolate chip, make a triple batch, scoop the dough into balls and freeze so you have cookies all spring long and you don’t just eat cookies over the holidays. I love the idea of freezing entire meals but they tend to take up so much space or lose a certain amount of quality when frozen. I do have exceptions that I’ll be sharing in the future but in general, I don’t freeze entire meals. I do freeze ingredients though. 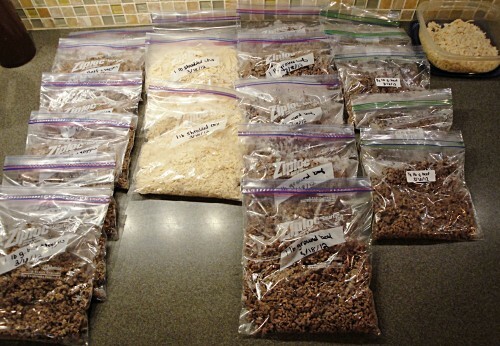 I love freezing pre-cooked and seasoned ground beef or shredded chicken. They come in so handy on a night I need a quick meal without going out to eat. My other tips are to freeze breads and doughs. I buy buns and freeze them or I make a double batch of pizza dough and freeze the dough for later. I just pop the dough out of the freezer in the morning, place it in a bowl on the counter and when I come home I just roll it out. I try to buy top Ziplock and gladware products for freezing because I know my items will be better preserved and it increases the chances of me being able to recycle the containers. If you buy foil pans, look for ones with flat lids instead of plastic ones. The plastic lids crack easier and you could experience the dreaded freezer burn when that happens. It also makes labeling your containers easy and that’s a must. I love using blank address label stickers to label my frozen meals with the item and date. The best flat-topped foil pans I’ve found at my local stores are actually from the dollar store. 3 pans for $1 is a deal I can’t resist. There are no words that accurately describe my Costco love. I love that I get quality meats there, I love that they have frozen herb cubes, I love their rotisserie chickens, I love their cheap flower bulbs, I love their dog food, I love their cheap gas, I love their smoothies. For a deep freezer they are a dream. I buy boneless skinless chicken breasts there and the cut is so perfect I don’t waste a bite. I can get steaks, pot roasts and pork roasts there for a rate much cheaper than I can at my local grocer. I buy frozen berries for smoothies and I can’t wait to try the new herb cubes my friend Wendy just told me about. Right now I already buy a huge jar of Costco’s pesto and freeze it so I can’t wait to try more herbs from them. My membership more than pays for itself with the discounts I receive and my membership allows me to get cash back. Costco isn’t the only place I get deals. After the price of bacon shot up nearly $5 a pack, I realized I didn’t want bacon to be a luxury. Now I stock up on bacon, hot dogs, and butter when there’s a great sale (watch during Superbowl, BBQ and Christmas seasons respectively) and freeze all the items. I’ve never had a problem with the quality and it ensures I don’t pay the $7.50 cents my grocer tried to charge me for bacon when there wasn’t a sale. 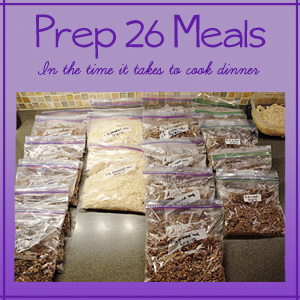 I’ll be back later this week to show you how I prepped 26 meals while I made dinner and cleaned the dishes. I don’t know where you are but here in my area the temperature has dropped and I am cold! On top of that, my freezer was full of ground deer meat from a deer my brother had killed last year. He was looking to clean out his freezer for hunting season this year so I was the lucky beneficiary. Knowing how cold Missouri winters can get I decided to put myself to work. Last weekend I made a quadruple batch of chili using the venison from my brother. Deer meat is amazing because it’s very lean and while some people find it gamey, I’m not one of those people. If you are, I promise you that this is one of those recipes where you don’t even notice what animal you are eating. My quadruple batch gave me dinner for 2 nights and I froze the other 3 batches leftover. Now when the holidays get to be too much I can just pop a container out of the freezer and heat it up on the stove in about 10 minutes. I like to serve my chili with some hot sauce, sour cream, oyster crackers, and cheese but you can do whatever your family likes. 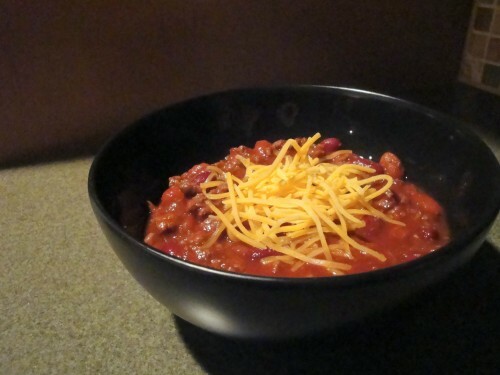 A wonderful chili meal for a cold day. Adapted from Food.com. Brown ground venison and separate finely. Add all the ingredients to a crockpot and stir together. Let simmer on low for 6 hours or on high for 2 hours.